Slowly but steadily the review teams in the UNCAC review process are completing reports covering the countries in the first year – those under review since July 2010. Of the expected twenty-six first year reports, nine have been completed according to published information. UNODC advises that several more reports are in the pipeline and that one of the reasons for delay is the need for multiple translations along the way. The full review reports are not accessible to the public unless the government decides to publish. Only Finland is known to have published theirs so far, while other governments are expected to do so soon. The review guidelines only call for publication of Executive Summaries, which to date have ranged in length from 7 – 12 pages. The summaries for Bulgaria and Indonesia were the latest to be posted on the UNODC website, in a document dated 16 January 2012, among documents for the upcoming Third Session of the Implementation Review Group (IRG) in June 2012. Other summaries can be found elsewhere on the UNODC website, eg. among information concerning the Second Session of the IRG that took place in May/June and September 2011 and the Fourth Conference of States Parties held in Marrakesh in October 2011. UNODC has advised that they will place all Executive Summaries in one single location on their website, together with any published self-assessments, but this transfer is taking time. Meanwhile, in a number of second year countries, civil society organisations (CSOs) report that country visits by review teams are underway. Unfortunately, UNODC is not authorised to publish information about the country review schedules. The paradox is that a process intended to promote transparency and accountability remains opaque. In June 2012, the IRG meeting in Vienna at its Third Session will assess the progress to date in the UNCAC review process and the resulting findings on UNCAC implementation. It will also hold its first-ever briefing for CSOs on 20 June. At the last UNCAC Conference of States Parties this briefing was agreed as a temporary substitute for CSO observer status in the IRG. 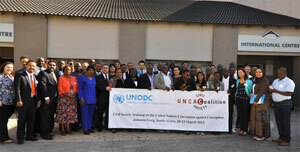 Read more news from the UNCAC Coalition in their latest Newsletter. ← Will the fruits of Africa’s commodity boom be lost to corruption?